Never underestimate a skilled catburglar. Pickpawcket is more than a delightful play on words. It's a challenging line of sight puzzle game with 60 levels and 30 Game Center achievements. 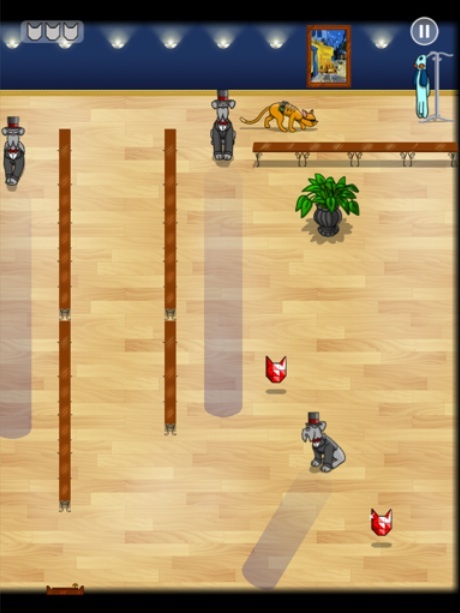 Most importantly, you get to outwit a bunch of top hat wearing dogs. Loopycube's enjoyable app casts you as a cat burglar, charged with retrieving paintings and up to three red gems per level from those annoying canines. In a way, it reminds us of Konami's classic PlayStation adventure, Metal Gear Solid, in the sense that you can see the dogs' lines of sight at all times, and must slip past their defenses unseen. Unlike Solid Snake, though, you won't snap necks or get into firefights. Instead, you'll distract your foes with wind-up squirrels, televisions and hop into costumes to evade detection. Even better, the game tracks your best times for each stage, giving you a chance to post those scores to an online leaderboard. It's a fun game, thanks in large part to the excellent touch controls. You simply press the screen, and the nimble feline moves to that exact point. The developers also do a wonderful job introducing new elements to the experience. Bottom line, getting all those gems won't be easy. That said, definitely give Pickpawcket a chance. You'll be pleasantly surprised. What's Hot: Addictive play, challenging puzzles, 60 levels, 30 achievements, Game Center support, universal, just $0.99. What's Not: A bit easy once you identify each dog's pattern.